We are proud to serve top-quality, certified choice beef that has aged a minimum of 21 days to ensure flavor and tenderness. Cuts Steakhouse offers catering options for various events. Please speak with a manager for more information about how Cuts Steakhouse can help make your event delicious! Cuts Steakhouse is pleased to offer private and semi-private dining space for events. Please speak with a manager about more information regarding your dining event. Please note that 20% gratuity will be added to parties of (6) guests or more. No split checks for parties of (6) guests or more. Consuming undercooked or raw meats, poultry, seafood, shellfish, or eggs may increase your risk of foodborne illness, especially if you have certain medical conditions. *Add a Cuts house, Caesar, or wedge salad to your entrée for $5. 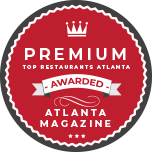 Our menu boasts a wide array of flavors and dishes from shrimp and grits to the most succulent steaks in Atlanta. Take a moment to review the menu above and work up an appetite for upscale southern food at its finest. Then contact us at 404.525.3399, today, and a make a reservation at Cuts Steakhouse in Atlanta for a true fine dining experience with the perfect pairing of food and wine. In the mood for steak? Or maybe you’re jonesing for old-fashioned, down-home cuisine. Cuts Steakhouse is your first destination for upscale Southern food, including appetizers, desserts, and of course, delicious, made-to-order steak. Our menu boasts a wide variety of Southern favorites, from classic shrimp and grits to decadent Georgia-style cheesecake. Take a moment to review our offerings while you work up an appetite. Then, reach out to make your reservation at our steakhouse in Atlanta, GA, and treat yourself to a fine dining experience you’ll never forget. You don’t need an excuse to enjoy your favorite cut with friends and family. However, if you’re looking to celebrate a special occasion, Cuts Steakhouse is a great place to bring your party. Our menus may include plenty of famous Southern dishes, but they’re far from ordinary – in fact, we think you’ll love our original spins on your favorite foods. The best way to find out how tasty our dishes are is to experience them in person, of course – but you can read on to preview our menus and start planning your visit. Don’t wait, request a reservation today to ensure you and your guests’ seats are saved. Lunch: Keep it light or go to town – the choice is yours when you join our steakhouse for a lunch that’s sure to satisfy. On display are filling salads featuring tasty veggies and your favorite cuts of steak, along with fresh catches like tuna. And, as always, you can opt for a full steak lunch if you prefer, but be sure to join us for dinner to enjoy an even wider selection. Dinner: Dinner at Cuts Steakhouse means upscale southern food like you’ve never seen it before. Not only are decadent sides like escargot and tomato caprese available, we’re cooking up even more of your favorite steak cuts, including New York strip and cowboy-cut ribeye. You’re sure to leave full when you finish up with one of our famous desserts. It’s a great way to finish a great meal! Wine: No steak is complete with the perfect wine to complement it. Our wine selection includes a healthy mix of reds and whites, as well as sparkling wines and champagne for special evenings. Not sure which is right for your dinner? Feel free to ask your server for a recommendation – we’re more than happy to suggest a glass that goes perfectly with your meal. Contact our steakhouse at 404.525.3399 to request more information about our menus’ delicious offerings. 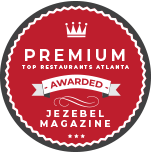 Our restaurant in Atlanta, Georgia, is accepting reservations now.